Additional Services – Turf and Landscape Inc. Outstanding service in everything we do. As a full-service landscaping business, we offer a diverse range of services to our customers. But while our skills mean we’re qualified to handle just about any outdoors project, we approach each with the same sense of pride. From residential to commercial, from installation to maintenance, our team is dedicated to providing you with outstanding customer service. That means that when you choose Turf & Landscape Inc. for your next project, you get fast responses, diligent work, and satisfying results. Commercial landscaping is unique to every location. Overall requirements and natural elements differ from property to property based on a number of factors. At Turf & Landscape Inc., our commercial landscaping services can be tailored to fit your needs. Whether you’re looking for a natural concept design, a better way to conserve water, or a team to execute an architect’s plans to their exact specifications, our team of experts can provide the services you need. If you want the grass on your property cut to perfection, our mowing experts are here for you. Our team of professionals helps you achieve the precise grass height and clean, trimmed edges. But a manicured lawn isn’t the only reason to choose us for your commercial mowing. We also save you time and energy. We have the commercial mowing experience, knowledge, and equipment to mow any property quickly and efficiently. That means you spend less time listening to loud mowers or going over missed patches and more time enjoying your well-maintained lawn. Pavement is resistant to rainwater, resulting in stormwater runoff that washes away soil and plants. With a permeable paver system, water travels through the pavers, not your landscaping. Pavers are designed to have a large water catch underneath, holding the water in place to be absorbed into the ground. This sustainable solution helps reduce flooding, erosion, and your maintenance costs without sacrificing your property’s aesthetic. Beautiful and functional, our team can create a rain garden that perfectly complements your home. Rain gardens are built in low spots to absorb excessive rainwater. By shedding rainwater into a temporary holding place with highly water-tolerant foliage, you create a cost-effective way to reduce runoff. They offer the ideal spot to place colorful flowers and native bushes to attract wildlife like birds and butterflies. If you’re looking to add a new feature to your landscaping that is as breathtaking as it is practical, we can design a rain garden for you. Landscaping upkeep is just as important as installation when it comes to maintaining your property’s beauty. 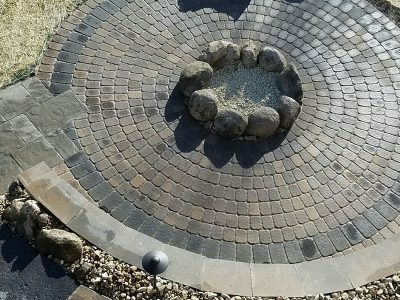 As time goes on, wear and seasonal changes require replacement parts, repairs, winterizing, and snow removal to preserve the quality of your landscaping. Our professionals are readily available to provide those services at a price you can afford. Ensure your property looks beautiful all year long when you choose Turf & Landscape Inc. for landscaping maintenance. Looking for other ways we can maintain your lawn or landscaping? Get in touch with us today to find out how we can help with your landscaping maintenance.